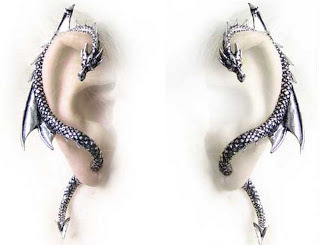 Now available as a pair of earrings, the ever popular Alchemy Gothic The Dragon's Lure Wrap Around Cuff Earring. Originally designed to be worn on one ear, until recently Alchemy have only supplied this earring for the right hand side, but for a limited period, Alchemy are producing some left sided pieces. At Little Bo's you can get the pair! Don't worry if you already have the earring for the right ear side. We now also have the earring for the left side sold as a single earring too. The Dragon's Lure -Like a whispering shoulder devil or a witch’s familiar, this dragon, piercing through the ear lobe, tempts the wearer into acts of shameful depravity. Designed and Hand Made in England by Alchemy Carta. Alchemy Gothic earrings are cast and hand-made in fine English pewter, many with additional high quality components, and all come complete with surgical-steel posts. The metal used in the manufacture of all Alchemy's pewter products is to BS5140 British Standard and are lead and nickel free.